Nina Nastasia's stoic, spooky-sweet music is art that unfolds in real time. 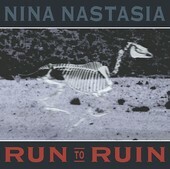 Her third album recorded live by the enigmatic Steve Albini, Run to Ruin, may be slightly less arresting and charged than her previous wonder, The Blackened Air, but it is no less beguiling, deliciously elusive and deeply satisfying. Nastasia's stripped and gently startling confessions are drawn from the same pool holding neo-art-folkies such as Cat Power and Mia Doi Todd, but they are filled with a greater sense of mystery and personal craft. The album's eight narcoleptic arrangements combine shimmering guitar strolls and sprinkles, sighing strings, precisely stumbling rhythms and flourishes of piano, hammered dulcimer and accordion. Stirring up the sensual and sometimes sinister soup is Nastasia's smoky singing which seems to forever be poking out from the shadowy corner of a somewhat subconscious world. Some tracks, like the sauntering-to-soaring On Teasing, sound like Suzanne Vega on an opium bender, while other cuts, such as I Say That I Will Go conjure images of Rickie Lee Jones arising from a deep slumber in a Turkish bathhouse. Nina Nastasia is a modern treasure, and those thoughtful and patient enough to let her cast her oddly charming sonic spell will find their souls richly rewarded.